At our office we have an on-site digital X-Ray machine. 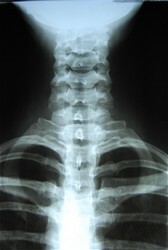 Many times we will need to complete an X-Ray of the low back and possibly the upper cervical area prior to beginning any adjusting or decompression. This helps target the problem area and also rules out any contraindications for not moving forward with chiropractic care (examples: disc lesions, fractures, rheumatoid arthritis). Depending on the findings, Dr. Bukaty may call for an MRI or other imaging study of the back.